The thought of Thanksgiving travel can conjur images of waiting in line for hours at the airport or missing your flight — and your perfectly roasted turkey along with it. But flying for Thanksgiving festivities shouldn't be a nightmare. With a little guidance, preparation, snacks and hacks, holiday travel can be a breeze. 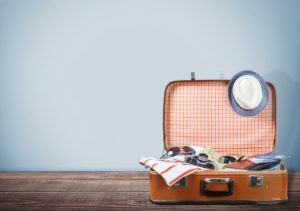 Before you head to the airport, check out these ProTips from Lisa Niver, travel expert and founder of We Said Go Travel, and Tony Holloway, a director at Virtuoso agency's Aladdin Travel. If you’re planning on flying this holiday season, stop what you’re doing now and fill out a TSA Pre-Check application. “I recommend all of my clients apply [for TSA Pre-Check] and get a Known Traveler Number” says Holloway. This way, you get to skip the longer lines (no promises during the holidays that Pre-Check lines will be non-existent, but they will be shorter.) Your Pre-Check lasts for 5 years so no need to renew every holiday season. We all want to look sharp on our vacations (be real, good outfits = more instagram likes.) However, assembling a great wardrobe can be a hassle when you're trying to fit all of your options into one bag. “My best packing tips are from my friend, Julie, who was the shop manager when I was assistant cruise director at Princess Cruises,” Niver shares. “She said: 'Commit to black or brown. Pick your colors so that nearly everything goes together and you have more outfit choices. And after you pack everything, take out half.’” Sage advice, Julie! With most airport lots costing upwards of $40 per day, you're looking at the equivalent of another plane ticket just to house your car for the duration of your trip. Plus, services like UberPool and Lyft make it super easy to get a ride on the fly. Not to mention the luxury of being dropped off right in front of your gate beats the hassle of hauling your luggage from the parking lot to bag drop. Niver advises, “Leave earlier [than you would normally] and bring snacks.” This should be a no-brainer, but there are plenty of you who still think you can get through security at a major airport in fifteen minutes. You can’t. It's not happening. During the holiday season, "More people are traveling than normal," adds Niver. Leaving during the week? 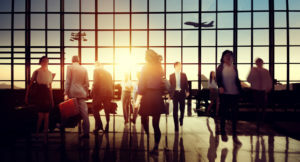 You should leave especially early, "because you’re flying with business traffic.” Most major airports now have nice amenities, so if you do get there with tons of time to spare, you can often find a spa for a quick massage or manicure. There is truly nothing worse than getting through TSA with your carry-on only to have to check it at the gate because you are in one of the final boarding groups. “When you have the airline credit card, you are often in an earlier group,” says Niver. Different airlines have different perks, so do your research. However, most airlines give boarding preference and a free checked bag to travelers with gold or platinum status and if you do use your credit card regularly, you’ll get the best advantages.